23/3/19 – Gizza has sadly passed away. 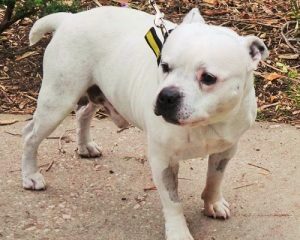 Sweetie boy Gizza is a 12 year old Staffy who’s getting thoroughly spoilt in foster care, through Dogs Trust Merseyside. He’s looking for a grown up only retirement home with lots of fuss on offer. Gizza will happily walk with steady dogs, but he doesn’t like to be approached by them, so will need to be the only dog in the home. He loves to settle down with a chew and do his own thing. He has sore back legs now and doesn’t want lots of long walks, but is up to three 15 minute walks a day now. Basically though, he’s a cuddly couch potato! 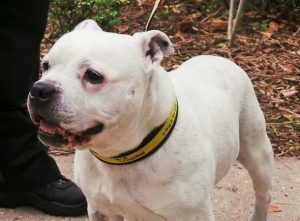 If you’d like to come and meet this cutie boy, you’ll need to contact Dogs Trust Merseyside and they’ll put an appointment with you in his diary. Please say you saw Gizza on the Oldies Club website.